Check out this video to see how security.manager allows you to grant users access to your data easily, while still controlling the content each user can view. security.manager – ArcGIS Edition smoothly integrates into Portal for ArcGIS and supports fine-grained access control to Portal items and apps. In this demonstration, users with varying access control settings are shown accessing the same portal items and applications. However, what they are viewing differs based on the permissions defined via the security.manager. In the first example, Amy can view the data and records for all power plants in the US, whereas Brad is only provided with access to those facilities that are in California. Gloria, the third example user, can only view the assets from her own company. She can then go on to build applications, like a Story Map, using the data she has access to. 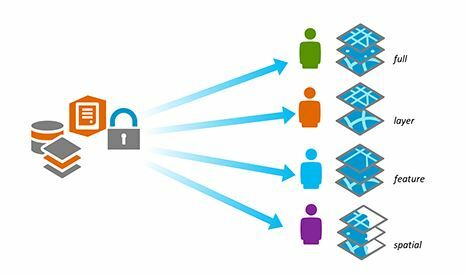 security.manager extends the security model of ArcGIS, allowing GIS Administrators to define permissions not just at the service level, but also at the layer, feature, and even spatial levels. You stay in control of the level of information provided to individual users. You can provide different groups with varying levels of access to a single service, allowing you to reduce the efforts and costs required to achieve your goals significantly. con terra security.manager – ArcGIS Edition controls access to services, right down to layer, feature level, and spatial extents. While a service is published only once, GIS Admins can enable different views for different users by limiting access according to a user’s policies. Additionally, this frees up space in your ArcGIS organization and can make keeping track of services much simpler. In June 2018, GEO Jobe announced an agreement with con terra GmbH, a leading provider of GIS software and professional services in Europe, that makes security.manager – ArcGIS Edition available to the North American market and beyond.